Born in 1974 in Bushbuckridge, Mpumalanga, South Africa, Sibongile Sambo showed an interest in aircraft from an early age, watching planes flying overhead and wondering one day if she would fly in those planes herself to different countries, meeting different people. Although her early career took her into the human resources environment, with companies such as De Beers and City Power, her dream of being involved in the aviation sector never left her. In 2003, with the South African government passing Black Economic Empowerment Act enabling people from previously disadvantaged backgrounds to enter and participate in economic life as entrepreneurs, Sibongile saw an opportunity to fulfill her aviation dreams. However, having no prior experience in the sector, nor the capital to purchase an aircraft, this posed an initial challenge, but not one that would deter Sibongile from realizing her dreams. "The company's objective is not only to capitalise on this market but also to take the business of flying to our people. There's still a lot that can be contributed in this field and I have taken the initiative to educate young black people about the aviation industry." I am indeed a Future Leader." Read the full Forbes list of 'Ten Young African Millionaires To Watch In 2013' featuring Sibongile Sambo. Ventures Africa features a fascinating article on Sibongile Sambo, South Africa's high flying aviation entrepreneur that is making waves in a traditionally male dominated industry. It appears, the sky's the limited for this tenacious and hardworking 'Lioness of Africa'. The 10,000 Women Initiative of Goldman Sachs has featured South Africa's high flying aviation pioneer Sibingile Sambo as a case-study. Read the Case-Study of South Africa's Sibongile Sambo and SRS Aviation. "I’m a risk taker. I fear nothing. When I apply my mind to do something, I go for it. The worst answer I can ever get is a ‘NO,’ but NO will never kill me. I wake-up the following day and do something different. For me it is the positive attitude I have in life. It has carried me to today." 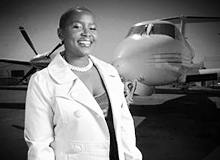 - Sibongile Sambo is a pioneering woman of South African aviation. She is founder and Chief Executive Officer of SRS Aviation Ltd., the first 100 percent black, female-owned aviation services company in South Africa. Launched in 2004, SRS is an integrated provider of private aviation services offering South African and international clients professional and personalized flight options including VIP Charter, tourist charter and helicopter services, to destinations around the world. Today, the company also provides maintenance, sales and fleet management services to private jet owners. Read Sibongile's full LoA profile here. "You need to have a good attitude. Running a business is never easy. You will meet people that will try to run you down. You will have cases where you will want to loose your temper. Always having a good attitude will help grow with your business." "One, you need to persevere on the business you’re running. Two, you need to network; you can’t stay in isolation. You need to network at conferences at the same level. This also gives you an opportunity to give input to other people and stay abreast of politics." eNCA profiles remarkable women in a series called August Women. Sibongile Sambo turned her dream of flight to reality by becoming the first black female to own an aviation company in South Africa. Part 1 Expertise ... Wisdom Exchange TV takes us to Johannesburg, South Africa, introducing a pioneer in the aviation industry. Sibongile Sambo is the Founder and Managing Director of SRS Aviation, the first 100% black female owned aviation company providing professional and personalized flight options to destinations around the world. Part 2 - Philosophies ... Wisdom Exchange TV takes us to Johannesburg, South Africa, introducing a pioneer in the aviation industry. Sibongile Sambo is the Founder and Managing Director of SRS Aviation, the first 100% black female owned aviation company providing professional and personalized flight options to destinations around the world. Part 4 - Leadership Lessons ... Wisdom Exchange TV takes us to Johannesburg, South Africa, introducing a pioneer in the aviation industry. Sibongile Sambo is the Founder and Managing Director of SRS Aviation, the first 100% black female owned aviation company providing professional and personalized flight options to destinations around the world. Sibongile Sambo the Chief Executive Officer and Founder of SRS Aviation Ltd., the first 100 percent black female-owned aviation services company in South Africa, launched in 2004 introduces the integrated range private aviation services her company offers to South Africans and international clients including VIP Charter, tourist charter and helicopter services, to destinations around the world. "Nobody will see you if you are sitting in your own corner. You have to go out there, you have to be visible, to do something to be able to get even more support and assistance,"
"I used to watch my mother negotiate at the market. People may not look at their mothers’ as a leader, but they truly have all the skills that demonstrate leadership." 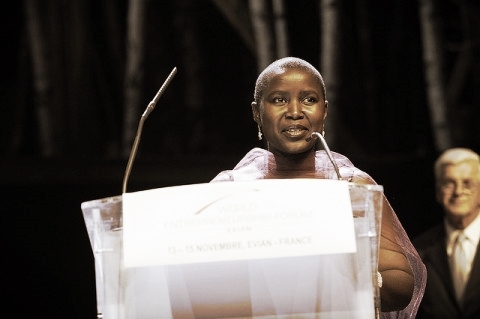 "As women in Africa we have so many industries we can get involved in, embrace them, however, we must not forget our responsibilities at home." "I have a philosophy; I question my intention, why am I living in this world? It is tough, and it gets lonely. The harder you work, the lonelier it gets." 2009 - nominated for the Queen Victoria Memorial Award (International Socrates Award) by the Europe Business Assembly in London.